Biff and Buff are tiny little dogs who love riding in their owner’s coat pockets when he goes out. Mr Pockets calls them his “pocket dogs”. One stormy night, a lost kitten appears on their doorstep and Mr Pockets decides to bring her into their home. At first, the pocket dogs love having a new friend to play with. But they soon become jealous of all the time that Mr Pockets spends with the new kitten. After having Mr Pockets to themselves for so long, the pocket dogs will have to learn about accepting, loving and sharing with their new family member. 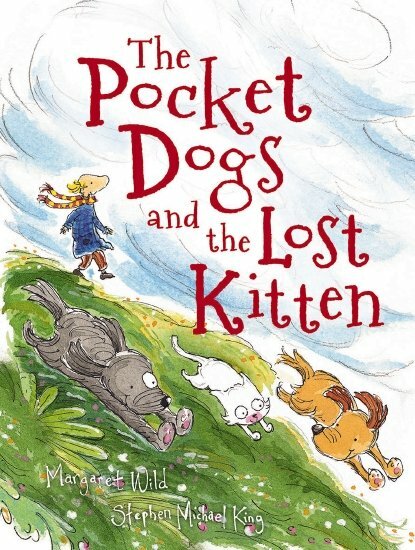 The Pocket Dogs and the Lost Kitten is a delightful book that will strengthen children’s understanding of the concept of sharing both belongings and love. It could be used to prepare for the arrival of a new member of the family. The enchanting illustrations allow for further discussion about the story and can be used to target inferencing skills (e.g. how are Biff and Buff feeling? Why does Mr Pockets look puzzled? Why is the kitten leaving?). The story is very well-written and there is a variety of adjectives, pronouns and verbs to support language development. See the list below for possible speech and language targets in this book.